New gTLDs: Are we at the tipping point? This post looks at three factors which indicates that new gTLDs are close to the tipping point(Malcolm Gladwell's coined term defining the moment of critical mass). 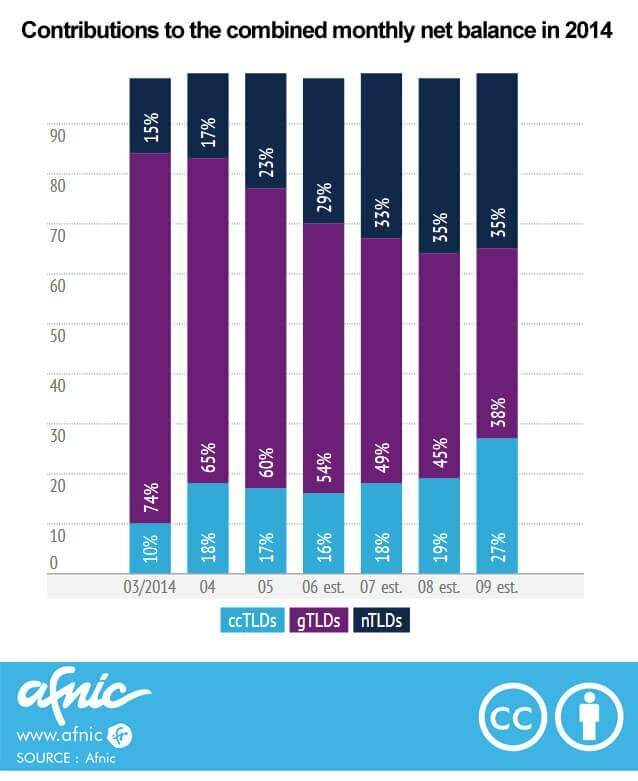 Just recently Afnic, the .fr registry, released a new study showing that new gTLDs are growing faster than both traditional gTLDs (.com, .net, .org, .info etc.) and ccTLDs (country code TLDs such as .fr, .de and .co.uk). The number is quite staggering. New gTLDs added only 17% of total new domains growth in April. In September this number had doubled. The numbers though should be taken with a pinch of salt. First off, new gTLDs are still a fraction of the total number of domains. They account for 1% of total registrations. ccTLDs count for 44,5% and traditional gTLDs 54,5% (mostly .com - now at 115m). Secondly, as Joseph Peterson points out at TheDomains : "Monthly net adds means the difference between new registrations and domain drops. In 2014, both ccTLDs and gTLDs are subject to non-renewals of domains from last year. But nTLD (new gTLDs) drops cannot show up until 2015. That’s a fundamental and serious flaw. Basically we’re looking at only gross new registrations for nTLDs but setting them side by side with net growth (after drops are deducted) for gTLDs and ccTLDs." As skewed as the study appears, it does seem that new gTLDs are stealing market share from the traditional gTLDs (with the exception of .com). gTLDs such as .us and .mobi are really taking a beating this year, while sales of .net and .info have stagnated. .Net is down 121.000 domains over the last six months. My question is therefore: Are we at the tipping point, where growth of new gTLDs will magnify at the expense of traditional gTLDs and other factors? We are now at 3.2 million registrations. Will we see "the hockey stick effect" in the near future? 1. Traditional gTLDs are taking a hit While total domain registrations grow month after month and are currently at 254m, the major traditional gTLDs are taking a hit, and it's happening right now. These are the direct rivals to new gTLDs. Just have a look at the latest numbers for .us from October, which is the 6th biggest gTLD with 1.6m registrations. As you can see this was a historic month, where deletions were at an all time high and registrations at an all time low. 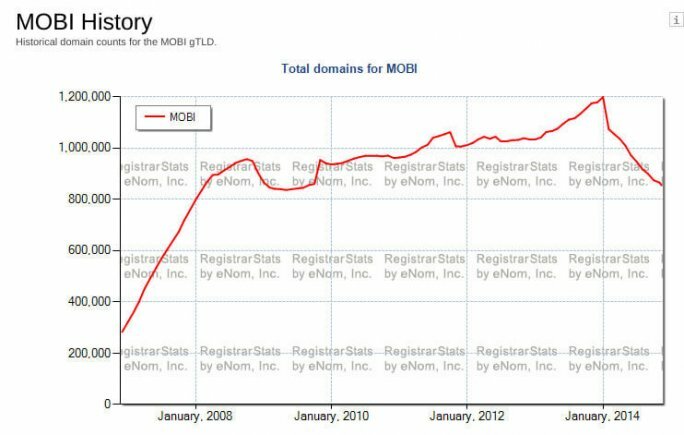 The .mobi registry was surely celebrating an all time high at New Year's, however since then they have crashed from 1.2m registrations to 858.000 registrations today. We are talking about a loss of 1/3 of the total portfolio in less than a year. That's brutal. .net and .info which have only experienced growth until now started to stagnate at the beginning of the year. As mentioned above .net has over the last six months lost 121.000 domains. As Verisign's CFO George Kilguss commented: “It’s going to continue. We’re seeing hundreds of more new gTLDs coming, and they’re coming at the rate of many every single week. So that confusion is likely to get worse.” ccTLDs are still left unaffected, which would indicate that registrants are jumping from the old gTLDs to the new ones. 2. Some new gTLDs get lots of press cover Especially the introduction of dot city TLDs for Berlin, London and New York have created awareness and sparked an interest in the new domain opportunities. The .Nyc launch was mentioned in all major media outlets such as Huffington Post, Wall Street Journal, cnn.com and all local newspapers. Michael Bloomberg's 400 defensive .nyc registrations definitely helped with the promotion of .nyc. 3. Dot brands are finally starting to move I wrote some time ago that dot brands are "the monster truck of new gTLDs", meaning that there is some real power behind these TLDs. Dot brand releases have been slow due to contractual issues with ICANN and lack of a strategy by the brand owners. Something's happening though. While I don't think we will see any dot brand owners rebrand the domain name, they will launch microsites and marketing campaigns using the dot brand. One of our sources confirms that a global brand will roll out a marketing campaign from January 2015 using their dot brand. This will create a lot of awareness about new gTLDs. Conclusion To summon up we see indicators that new gTLDs are near the tipping point. The traditional gTLDs are rapidly losing market share, and it seems that the new gTLDs are the ones taking over their market share. At the same time some of the more prolific new gTLDs have been able to raise public awareness about the new type of domain names. Thirdly, the launch of "the sleeping giant" dot brand is very close, and will surely have an impact on general awareness.